Like Gucci or Porsche, Darkglass remains the state of the design art. More affordable competitors do exist. If you’re interested in smoothing out the volume of your playing, changing the envelope of your notes so that they bloom and fade differently, or simply altering your tone in yet another way when you already have the ability to do that with your fingers, or with your bass, amp and any given effects pedal, you may well be in need of a compressor. If not, do not hesitate to move swiftly onwards; compression is a controversial subject in bass world, largely because many non-experts literally cannot hear what a compressor does and regard them as a waste of time and money, whereas seasoned compression fans swear by them. Personally we’re somewhere in the middle. Compressors of the many kinds that we encounter generally do have a beneficial effect, we find, removing the odd volume spike and adding some colour to the tone. Then again, the bassists who really need them tend to be professional or semi-professional recording and touring musicians; these people make up a relatively small percentage of the bass-playing population. All that aside, if you do find yourself needing to enter compression world, one of the most lustrous, aesthetically sharp bits of kit you’ll ever find is this new Hyper Luminal pedal from Darkglass. The company has been riding a wave of cool for the last few years, due to the undeniable quality of its products as well as the support of a massive swathe of enthusiastic shredders, mostly of the heavy metal persuasion - and it helps, of course, that their pedals look insanely cool. This particular unit takes that concept a step further, with two of its controls touch-sensitive jobs. Plug in and you’re greeted with an eyeball-soothing display of diamond-blue LEDs. The idea here is to encompass two vintage compressor tones, plus Darkglass’s now-discontinued Super Symmetry unit, in one. You’ve got a relatively simple layout: Blend mixes the clean and effected signals, Time sets the attack and release times of the effect, Output handles the output volume and Compression determines the level of, well, compression. The press-to-use Ratio and Mode controls determine the style of compression and select between the three compressors, respectively. On the Mode control, BUS indicates the Solid State Logic module from the 80s, FET is inspired by the vintage UA 1176 unit, and SYM means Super Symmetry. Dig in, they all work, and they all work slightly differently. It’s SYM that offers Darkglass’s most bass-friendly sonic features - super-punchy top end and high mids that can cut through the rest of your band like a machete through a piñata. Max out the Blend and Compression for the most audible tone colouring, or roll on slightly for a more subtle effect. 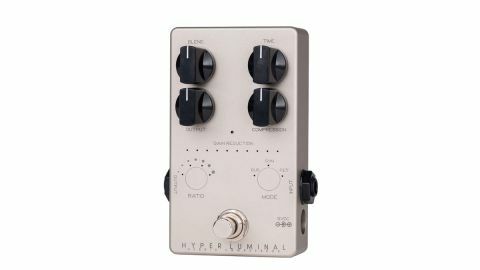 You can use the Hyper Luminal as a transparent booster if you minimise everything apart from Volume, and if you need more options from this already versatile pedal, you can plug into your computer via the supplied micro USB cable and use Darkglass Suite software to fine-tune the parameters. You can also switch Mode functions in this way. Our only slight concern is that this little pedal may not survive when (not if) your band’s intoxicated guitar player accidentally stamps on it. The build is flawless as far as we can see, but the Hyper Luminal isn’t as big, heavy or tough as previous Darkglass units - so maybe leave it in the studio, eh?